Do you know what farm your food comes from? The Mabry Elementary Student Nutrition Program does! Our school lunches feature Florida Fresh Fridays with fruit and vegetable options grown on local farms. This month will feature fresh star fruit (That’s right! Star fruit!) from Unity Groves in Homestead, FL and green beans from Pero Family Farms in Del Ray Beach, Florida. Click the links to learn more about each farm. Save time, save money, and eat local - encourage your kids to buy lunch and participate in Florida Fresh Fridays! Be well. When: Every Wednesday beginning October 3rd. Check out the calendar of events on this website for specific dates. 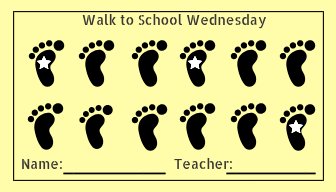 New this year, students will receive a weekly punch card marking each week they walk or bike to school on Wednesday and a special "Toe Token" for each milestone - 1 week, 4 weeks, 12 weeks and more. Students who reach the 12-week milestone will be recognized on the morning show and entered into a drawing to win health and fitness prizes for their classroom! Every class that has at least one walker or bike rider on October 3rd will receive a new playground ball for recess! Parents and family members are encouraged to walk or bike to school with their children, however may not enter campus, per our new safety policy. Cards will be punched at the front and back gates. Skip the carline and join us on October 3rd! Where: Walk or drive to the walking school bus starting point closest to you. If you live along the way, see the time schedule for an estimated time of arrival. Click here for the WALKING BUS ROUTES. Why: Friends, Family, Physical Activity and Fun!